Hearing Health Foundation (HHF) is working around the clock to help find cures and treatments and also to better the lives of those with hearing loss. And we are doing it with a small and incredible team. Recently I attended a bowling outing with HHF's full-time staff and our mighty army of interns. (Please see the photo.) Missing are Yishane Lee and Robin Wisser Kidder whose wonderful talent is used to edit and design Hearing Health magazine; Caroline Oberweger who aids with foundation grants; and Frankie Huang who helped as a marketing intern. Increase awareness of preventable noise-induced hearing loss by developing. partnerships with peer organizations and corporations. Register to fundraise in every state—a necessary and time-consuming process. Write blog posts and magazine articles on various hearing loss topics as well as hearing research. Secure media placement in the following outlets: The New Yorker, The Guardian, Men’s Journal, and others. Rewrite our internal policies and procedures to streamline activities and reduce costs. Send supporters and constituents countless communications including magazines, letters, and appeals to raise funds so we can continue our important work. Communicate with the Federal Drug Administration, Federal Trade Commission, and various elected officials regarding the critical need for affordable hearing health care (e.g.,. over-the-counter hearing aids) and significance of funding hearing research. Advocate for the reversal of the 2018 federal budget’s proposed elimination of all federalUniversal Newborn Hearing Screening funding, $18 million in total. Announce our newly formed partnership with Hearing Charity of America’s Hearing Aid Donation Project to collect used hearing aids to give to those who need. Increase Hearing Health magazine ad sales revenue enabling HHF to invest in growing its readership. Continue to receive top ratings from charity watchdogs with HHF named twice in two categories in Consumer Reports’ top five best charities. And most importantly increase funding to our critical hearing and balance research programs promoting innovative approaches by both early-stage scientists and established experts in their fields! At HHF we all live and breathe our mission. I would like to recognize and express my gratitude to those the who give of their time and talent to our cause. There is much to do and many unmet research needs—but together we will get there. From the bottom of my heart I am grateful and hope you wil join me in thanking these folks. They help make it all possible. Nadine Dehgan is the chief executive officer of Hearing Health Foundation. Hearing Charities of America (HCOA) and Hearing Health Foundation are excited to announce a newly formed partnership in an effort to collect hearing aids that will be given to low-income individuals through the HCOA’s national assistance program, The Hearing Aid Project. One quarter of Americans ages 20 to 65 suffer from hearing loss, which makes it one of the country’s most widespread public health concerns. The Hearing Aid Project was created to provide access to affordable hearing health services, while creating collaborative relationships to support this mission. Countless hearing aids sit unused in drawers or are discarded once new hearing aids are purchased. Hearing Health Foundation is now a collection center for The Hearing Aid Project to ensure that quality, donated hearing aids can be refurbished and given to those in need. “Hearing Health Foundation is thrilled to join forces with Hearing Charities of America and do our part in collecting hearing aids to be refurbished and distributed to those who need them,” said Nadine Dehgan, HHF’s CEO. “Minimal health insurance and Medicare coverage, as well as out-of-pocket costs, have been a major hurdle for many who could benefit from using hearing aids. Until quality hearing healthcare is available to all of the 48 million Americans living with hearing loss, HHF is glad to be doing its part to provide hearing aid assistance to those in need,” Dehgan said. Hearing Charities of America and Hearing Health Foundation believe that healthy hearing should be enjoyed by all. To donate your hearings aids to be refurbished, please contact Hearing Health Foundation at info@hhf.org or 212-257-6140. In celebration of Better Hearing and Speech Month in May, Hearing Health Foundation is launching the Hearing Health Challenge. Although hearing loss is commonly associated with one’s normal aging process, more than half of those with hearing loss are younger than 65. The top two war wounds for active military personnel and veterans are hearing loss and tinnitus, accounting for 60 percent of this population. Unfortunately, only 13 to 33 percent of those who need hearing aids use them; financial constraints, the lack of a perceived need, and stigma are leading reasons why hearing loss goes untreated for an average of 7 to 10 years after diagnosis. Hearing Health Foundation is committed to reducing the stigma, educating the public on the dangers of noise, advocating for greater access to hearing health care, and funding the best science to find better treatments and cures for hearing loss and its associated disorders. For every hearing aid received within the month of May, a $200 cash donation will be made to HHF by an anonymous donor to support hearing research. For every dollar donated within the month of May, that dollar will be matched up to $33,500 by an anonymous donor to support hearing research. 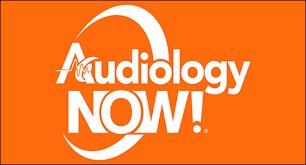 The American Academy of Audiology’s (AAA) annual conference, AudiologyNow!, took place in the Indianapolis Convention Center in early April. Although four days of lectures addressed nearly every aspect of the audiological scope of practice, one overarching theme emerged this year: How will the field of audiology evolve from here? This past year has posed various disruptions to the field of audiology, such as how over-the-counter hearing aid legislation will change delivery of services, how the continued interest in personal sound amplification products (PSAPs, also called “hearables”) will guide consumer choice, and how to improve evaluations and interventions to best serve individuals with hearing loss. These questions, along with many others, fueled an exciting dialogue among professionals from around the country. AAA President Ian Windmill, Ph.D., urged members of the academy to embrace disruptions to the field, including the recently introduced legislation for nonprescription hearing aids. Although these changes may appear as an encroachment on the audiological scope of practice, Dr. Windmill urged that these may actually be beneficial to the field. Dr. Windmill said hearing healthcare has never been more in the public eye or as highly discussed by health officials, politicians, and consumers than in this past year. This increased awareness could lead to the prioritization of hearing health, as consumers grow more cognizant of the repercussions of hearing loss. Furthermore, the introduction of hearing solutions at various price points and technology levels may improve accessibility. If audiologists were to embrace these alternatives to intervention, they will successfully evolve with the field while simultaneously demonstrating to consumers their dedication to patient-centered care. This sentiment was echoed throughout the conference’s sessions. Additionally, multiple lectures discussed how audiologists could improve delivery of patient-centered care by improving counseling skills, utilization of self-assessments, and consumer education to shift the locus of control from care provider to joint decision-making between the consumer and the hearing provider. Lastly, leading professionals in the field encouraged a return to the audiologists’ roots as rehabilitative professionals. In the years since the audiological scope of practice expanded to include the ability to dispense hearing aids, audiologists have slowly shifted their focus from providing rehabilitative services to a device-driven service centered on hearing aids. However, the delivery of unprecedented auditory rehabilitation to foster successful communication strategies will enable our profession to succeed in the face of the many disruptions to hearing technology. AAA’s willingness to acknowledge the challenges facing hearing healthcare is very promising to its successful evolution as a field. Although the field of audiology is currently experiencing some growing pains, many hearing healthcare professionals are embracing this opportunity to rethink the delivery of care and how to improve patient satisfaction by challenging the status quo. In honor of World Tinnitus Day April 18, Hearing Health Foundation (HHF) wants to draw attention to the effects and challenges associated with tinnitus. The U.S. Centers for Disease Control estimates some 15% of Americans—about 50 million people—have experienced tinnitus. Roughly 20 million people struggle with chronic tinnitus, while 2 million have extreme and debilitating cases. It is also a top war wound among active U.S. military personnel and veterans. Tinnitus is defined as the perception of sound when there is no external, acoustic source. Individuals with tinnitus may describe the noise as buzzing, hissing, whistling, swooshing, or clicking. Roughly 90 percent of tinnitus cases occur with an underlying hearing loss. Tinnitus can be either intermittent or chronic. People who experience intermittent tinnitus occasionally hear sounds in their ears that can last from minutes to hours after being exposed to excessively loud noises. An example would be someone sitting near the fence of a NASCAR race without wearing hearing protection. People with chronic tinnitus, on the other hand, often experience noise more frequently, which can last for more than three months. The impact of tinnitus on everyday life differs from person to person. Researchers found that most people with chronic tinnitus are not too bothered by it. Many of these people prefer to only see a doctor for assurance that their tinnitus is not an indication of a serious disease or impending deafness. People who were bothered by their tinnitus reported that it was annoying, invasive, upsetting, and distracting in daily life. In a small tinnitus self-help group, some members frequently describe having problems sleeping, understanding speech, poor concentration, inability to relax, and depression. People with age-related hearing loss, or presbycusis, may also experience a ringing, hissing, or roaring sound in the ears. Presbycusis progresses over time and is generally more severe in men than in women and the risk increases with age, as shown in epidemiological surveys. Although there is no cure for tinnitus, there are available treatments that can minimize tinnitus symptoms. Tinnitus Activities Treatment (TAT), cognitive behavioral therapy (CBT), and Tinnitus Retraining Therapy (TRT) are sound therapies that can lessen the effects of tinnitus, often times very helpful in combination with counseling. Furthermore, by using hearing protection and noise reduction technologies, and by avoiding excessive noise, many people can prevent significant hearing problems. Taking care of your hearing should always be part of keeping healthy overall. If you suspect a hearing loss or tinnitus, HHF recommends getting your hearing checked. If you do have a hearing loss or tinnitus, talk with your hearing healthcare professional about available treatments. For more information, visit hhf.org/tinnitus or email us at info@hhf.org. Laura Friedman is the Communications and Programs Manager of Hearing Health Foundation. Want to Be Happier in 2017? Try a Hearing Test. When you’re making your list of New Year’s resolutions and to-dos for 2017, be sure to put this one near the top: a hearing test. That’s right. Research shows that when people address hearing loss it improves their quality of life in many ways. And it’s no wonder. Ignoring a hearing loss and leaving it unaddressed can be exhausting, lead to isolation, and has been tied to an assortment of health conditions, including depression, diminished cognitive function, and an increased risk of falling. But when people get a hearing test and use professionally fitted and individually programmed hearing aids—when recommended by a hearing care professional—most say they’re happy with the improvements they see in multiple areas of their lives. Your spirits may brighten. People with hearing loss who use hearing aids are less likely to feel down, depressed or hopeless, BHI research shows. Your relationships may benefit. Most people with hearing loss who use hearing aids say it has a positive effect on their relationships, according to a BHI survey. Research also finds that they’re more likely to have a strong social network. You may start to see life’s sunny side a little more. People with hearing loss who use hearing aids are more likely to be optimistic, feel engaged in life, and even get more pleasure in doing things, BHI research finds. Taking the reins on life might become easier. BHI research shows that people with hearing loss who use hearing aids are more likely to tackle problems actively. Not a bad New Year’s resolution in and of itself. It may lighten your cognitive load. Experts say that effortful listening due to unaddressed hearing loss is associated with increased stress and poorer performance on memory tests. If you don’t have to put so much effort into listening due to untreated hearing loss, more cognitive resources may be available for other things—like remembering what was said, or enjoying the conversation with friends. So, go ahead. Make a hearing test one of the New Year’s resolutions you keep in 2017. So do it for your health. Do it for your happiness. Get a hearing test. The content for this blog post originated in a press release issued by The Better Hearing Institute.